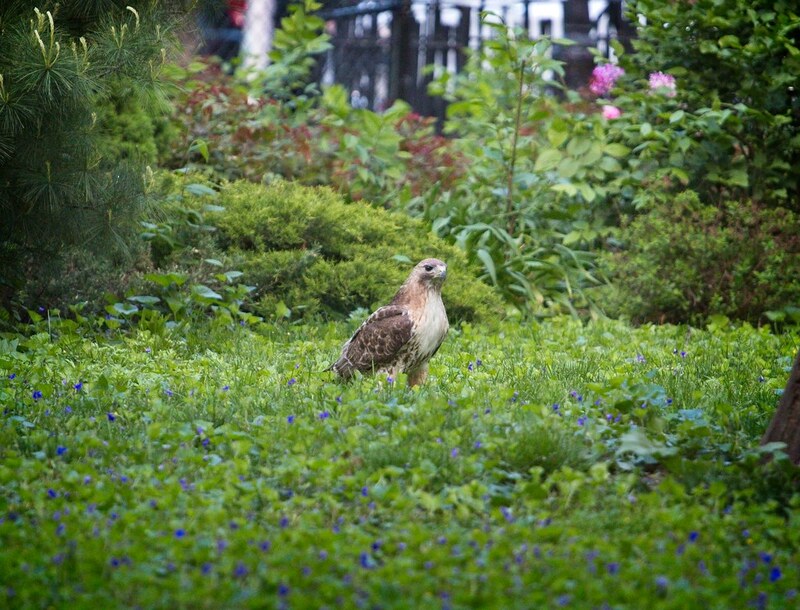 The number of hawk babies up in the nest in Tompkins Square is still difficult to determine. Christo and Dora definitely have one, possibly more, but it's been a challenge to get a good view of what's happening up there. We will just have to wait for the nestling(s) to get bigger. Over the weekend, I managed to get this rather awful photo of Dora feeding a chick. It's the whitish blob to the right of the branch that runs vertically up from the nest in the center of the photo. 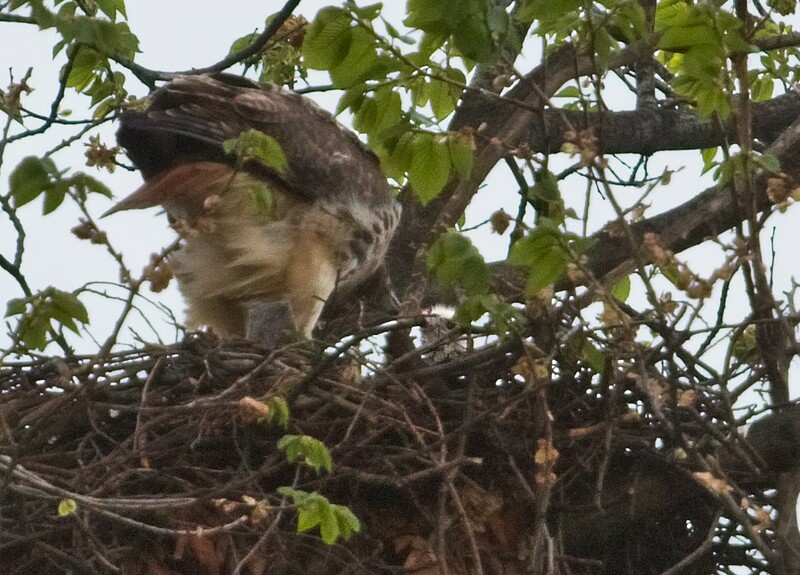 The weather has also been uncooperative for photos - it's been mostly cloudy, rendering the nest dark. 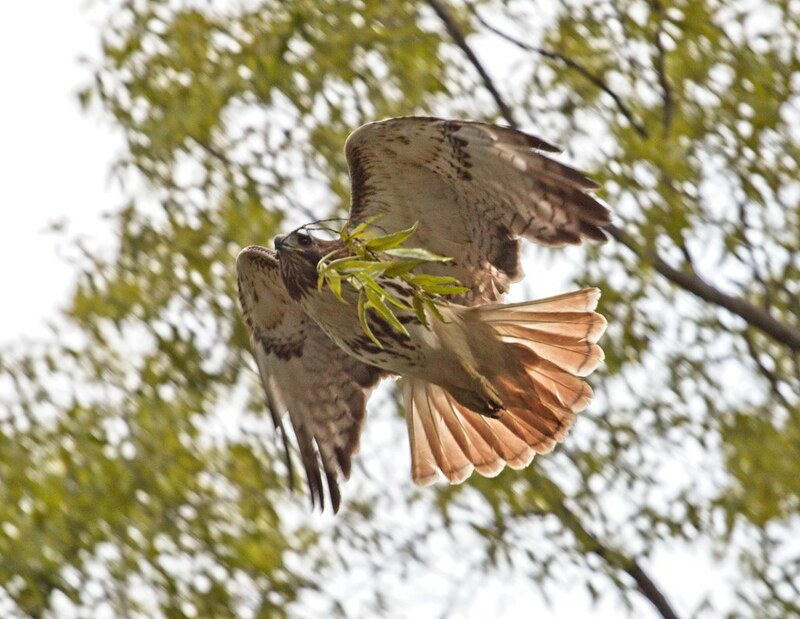 When the sun comes out, the hawks cover the nest. There's not been too much activity other than Christo hunting and Dora fetching greenery once in a while. Here she is with a long piece of bark. I found Christo hanging out in his favorite patch of wildflowers. What did he picked up from the grass? It's a severed starling head! He flew right at me with it and made his "growling" sounds. 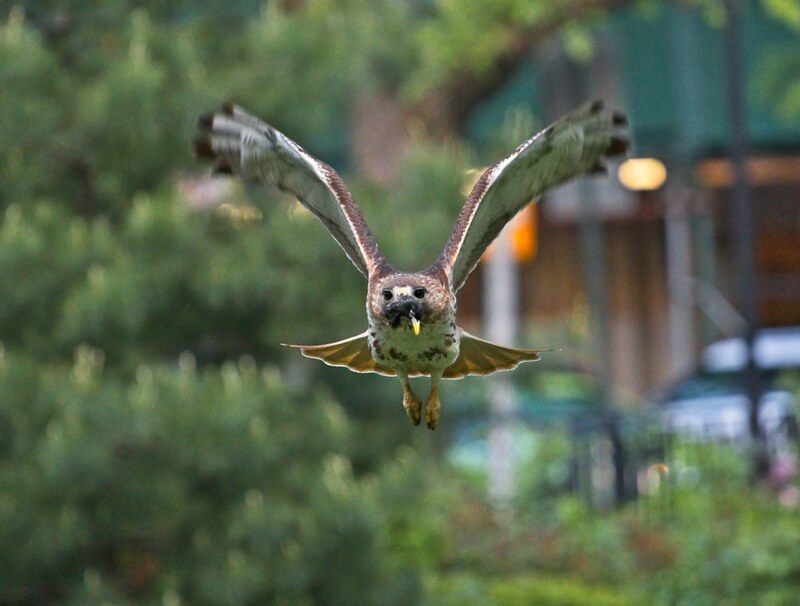 I've never heard another hawk make the sounds he does and I can't seem to find any documentation on this type of vocalization. If anyone knows about this, I'd love to know more. 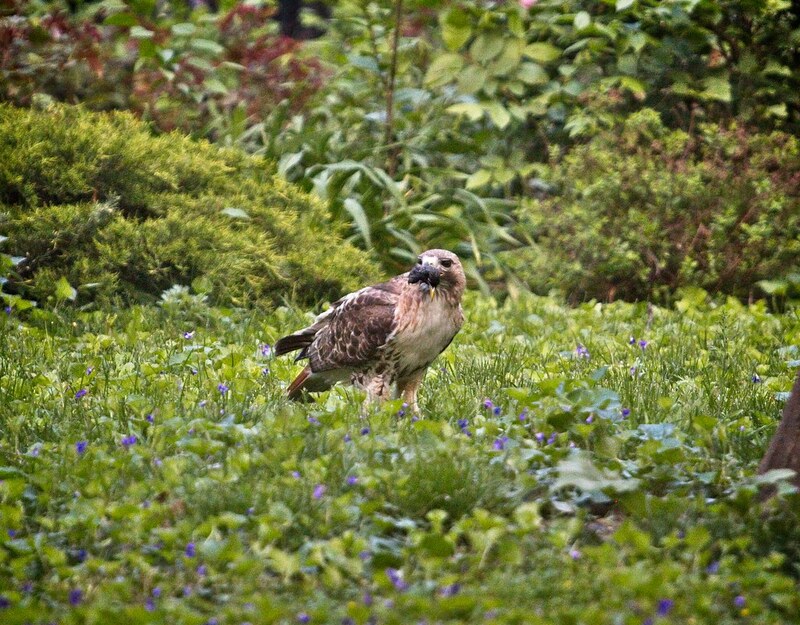 The sound he makes is not the hawk scream, or the food cry, but it's more like a low cat growl. He does it while flying. Christo took the starling head to a nearby tree and ate it. 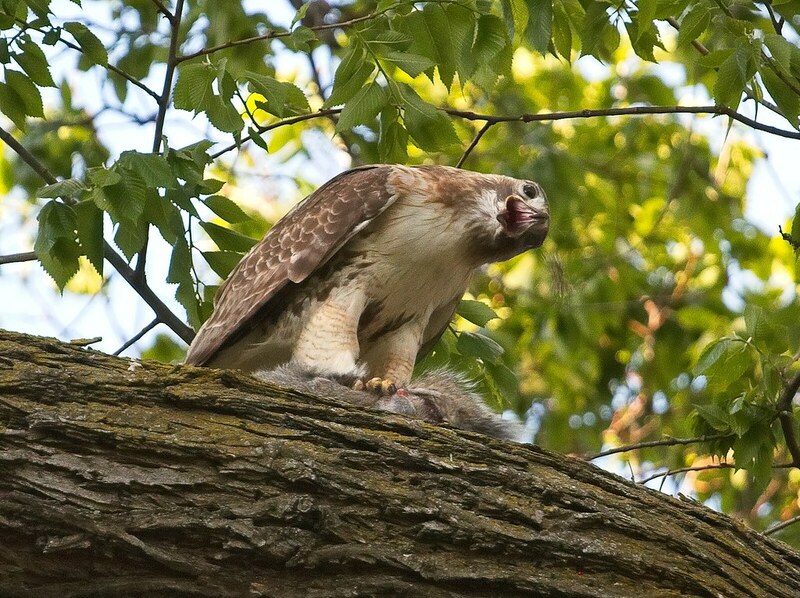 He usually eats the head of his prey first, so I was surprised to see him scavenge this one. Perhaps he dropped it earlier when he caught the starling. The patch of wildflowers under the locust tree on the east side of the park seems to be a dumping ground for discarded prey parts, so anyone thinking of laying on the grass in there should take note. Christo recently displayed some other interesting behavior. 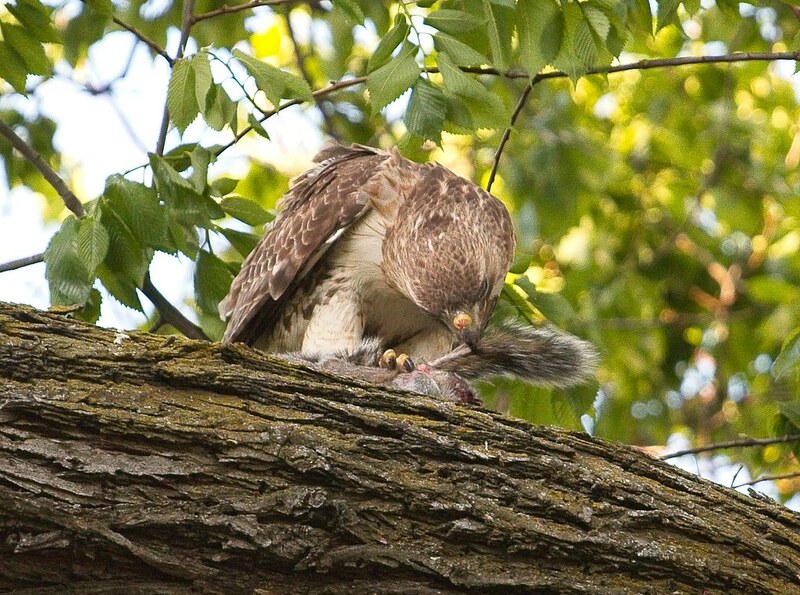 I've previously seen him scrape the fur off a squirrel tail before eating the rest of the squirrel. I assumed he did this so the furry tail didn't tickle his face while eating. On this day, however, Christo ate some squirrel and then removed the fur from the tail. 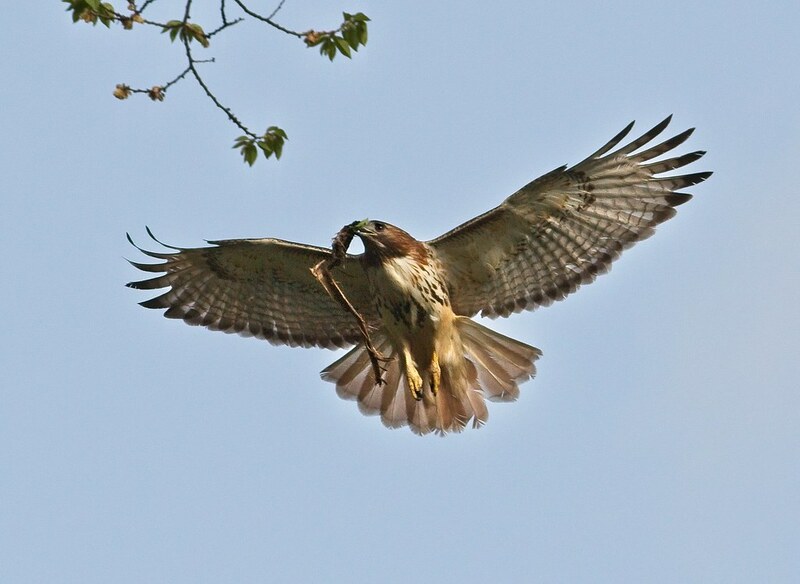 He took the bare-tailed body back to the nest. 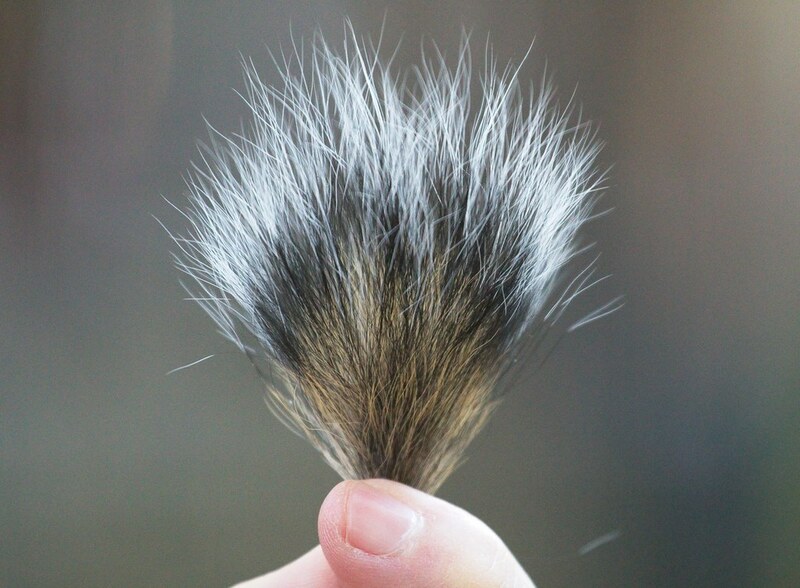 Although he left the bare tail on the squirrel, Christo did clip off the fuzzy tip, which fell to the ground in front of me. 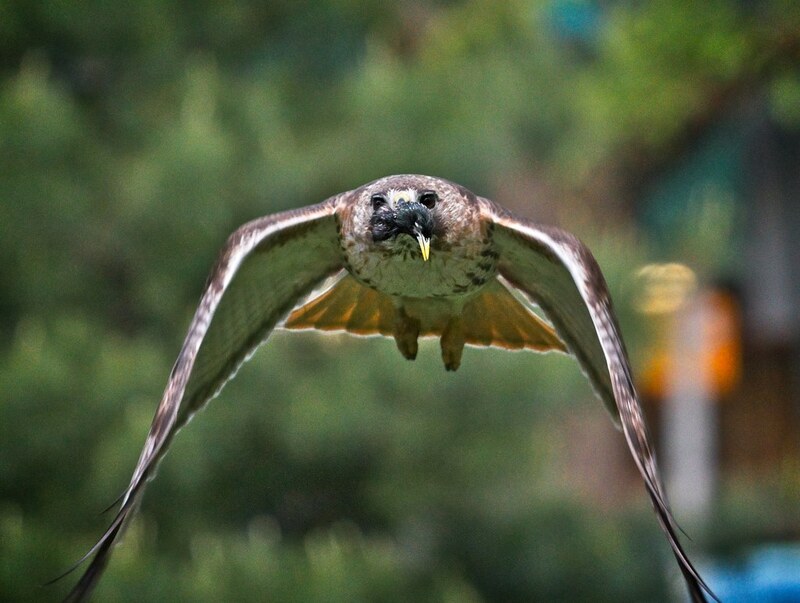 On Sunday, Christo was harassed by a kestrel while perching on top of the Christodora. No respect! 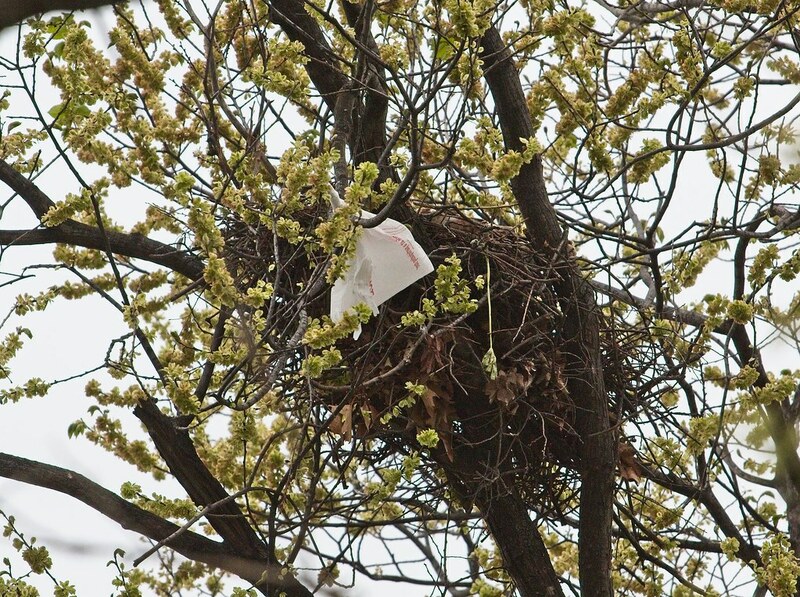 Meanwhile, a plastic bag made its way up to the nest. I don't believe the hawks took it up there - it likely blew up there on its own. After a couple of days, it was gone. Just a reminder that our litter does affect wildlife. 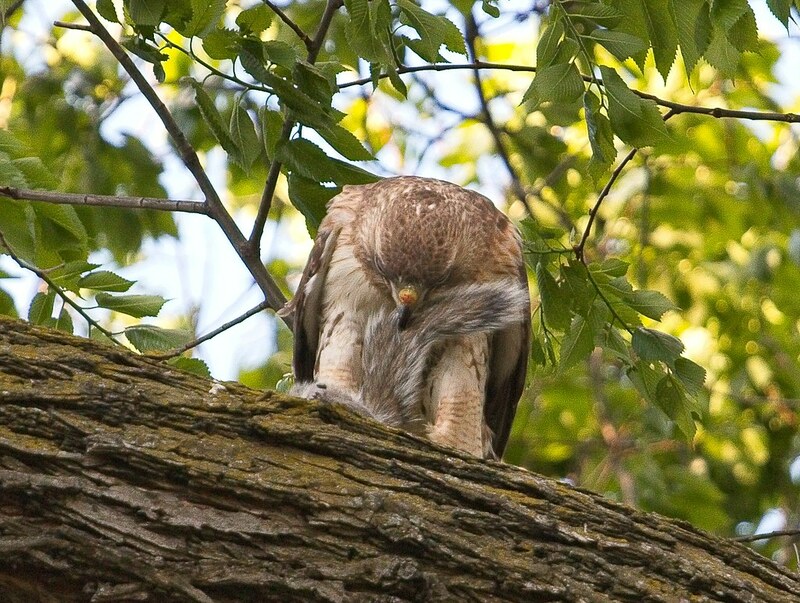 I hope to have an update on the number of baby hawks soon. I'll post when I know.